The bathroom is one of the most-used rooms in our house and I am sure it’s the same in your household too, and as such, it takes much more of the brunt of daily wear and tear that comes with everyday life. Its also the one I find myself cleaning the most, after all, it harbours so many germs and is one visitors always head to at some point and there is nothing worse than a messy bathroom when guests pop over unannounced. 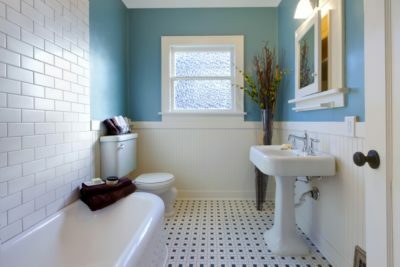 Bathrooms can be notoriously expensive to revamp or redecorate though – so can end up a little neglected. But don’t despair! It’s more than possible to give your bathroom the makeover it deserves even on a tight budget. Here are a few tips to help you know where to spend your budget to make the biggest impact. It’s truly amazing what something as simple and inexpensive as a new coat of paint can do to upgrade a bathroom. For the walls and ceiling, you’ll need to invest in mildew and mould-proof primers and paint. Cover any dingy surfaces including the cabinets to brighten up the whole room – only when you do will you realize how much of a difference it makes to the overall look! If the budget’s too tight, though, skip replacement and focus instead on deep cleaning. If your budget won’t stretch to a new bathroom suite – or if you don’t really want to replace your current one for purely aesthetic purposes – then consider updating them with a suitable paint. For example, simply painting the outside of an old roll-top bath will give instant, dramatic results that can be the focal point for the rest of your revamp. Consider options carefully before getting the electrician though, as you’ll want to make sure the new lights fit with the aesthetic of the room. Hanging a small chandelier with crystal drops over the vanity can be dressy and sophisticated. Replacing harsh bulb strips around the mirror with sleek sconces is an immediate modern update. By adding a new bathmat with a splash of colour or even changing the colour scheme of your towels you can change the look and feel of a room effortlessly and very cheaply too. If you have a plain white bathroom then adding a bold colour to these accessories can draw the eye away from the white and make it look bigger in the process. Try to go for matching colours or pick a theme rather than a mishmash of whatever you have in the linen closet, the sales are a great time to update these accessories. I have been looking over at Julian Charles to update our colour scheme, we have a white bathroom with Purple accents currently but the paint is calling me and I am thinking teal is this year’s colour. Tidy away toothbrushes, toothpastes, brushes, hair and shaving accessories into a drawer or cupboard if you can to keep surfaces clean and clear – cluttered shelves make a room look smaller so by putting away you can create an illusion of more space. If you don’t have anywhere to store these then wicker baskets are an option – of course, if you get the bug then Netflix has the answer for you in the new Marie Kondo series, that’s not really my thing but I have friends who are raving about it. Bath toys can also be placed into a hanging storage bag or perhaps a large bucket to help the room tidy too, and keep mirrors clean as it really does help make a room cleaner and clearer. ← Do I have the patience to be a football parent? There’s some to tips here, that’s for sure! Thanks for the ideas!